Set of 5 bolts works to mount one manifold. You will need two kits if you have a V-8. These are OEM copper-clad exhaust bolts used to attach exhaust manifolds to the cylinder heads. You need two long, two medium and one short one (for a total of five) per manifold. The copper discolors after exposure to high heat, but the copper cladding does not go away. 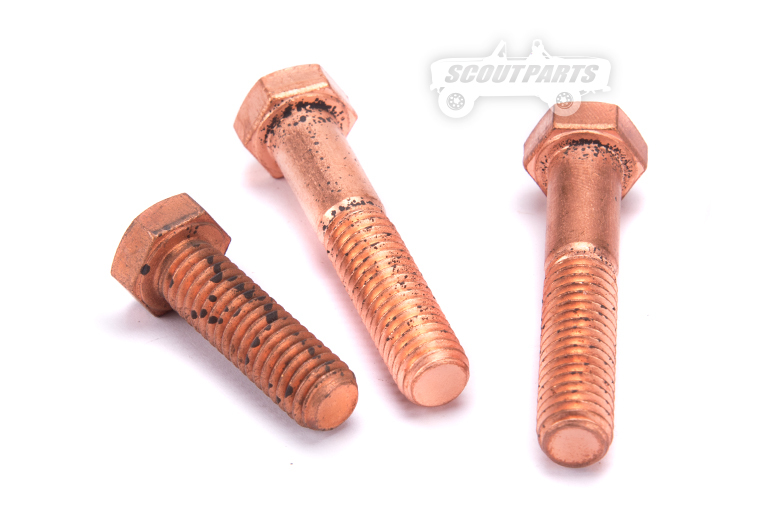 The copper coating makes the bolts easy to remove even 40 years later. These are highly recommended. V8 engines will require two sets. I have personally removed at least one hundred IH exhaust manifolds and have never, NOT once broken a bolt. These were used at the factory and they really keep the bolt from fusing to the block.